I had the pleasure of visiting my friend Holly's lovely garden last week. 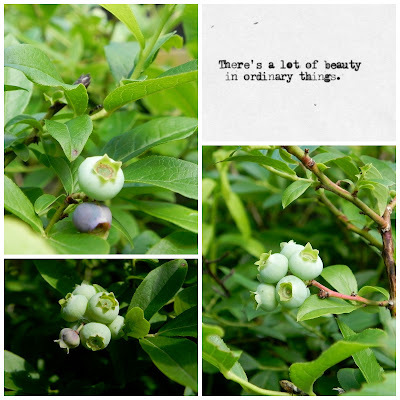 While there were many beautiful views to be had that day, the sun was blazing in the early summers sky which made taking photos a particularly challenging event (for me), but these blueberries made my day. I think I need to grow blueberries. In saucepan bring water to a boil. Add sugar, reduce heat, stir until dissolved. Remove from heat, stir in lavender blossoms. Steep 30 - 60 minutes. Strain. Stir in LJ. Cool, serve with crushed ice. Hello Summer . . .
Fuel for my . . .